“I just need to edit some audio. What software should I use?” You hear this question all the time, and there’s rarely a good, simple answer. (Yes, there’s the open source program Audacity, but it’s got major functionality missing, a kludgy interface that’s hard on beginners, and some stability issues. It’s hardly the best open source has to offer.) Adobe is working on a solution for Mac and Windows they’re calling Soundbooth. Soundbooth won’t be released until early next year, but when it does hit, it could finally be the basic entry-level audio editor for which Mac and Windows users have been looking. The coming months will tell. Here, we’ll preview its functionality in a pre-release, feature incomplete state. Acquisitions are often bad omens for software products, but in the case of Adobe purchasing Cool Edit Pro and transforming it into Audition, good things have been happening. Audition 2.0 is currently my audio editor of choice on any platform: it’s got a great interface, lots of powerful effects, multitrack capabilities that will nonetheless get out of your way when you don’t want them, strong roundtrip workflows with Premiere (something that still doesn’t work quite right in Soundtrack/Final Cut), and fantastic editing tools including a full editable spectrum view. In other words, it’s Audition for graphic artists. The basic interface is almost identical to Adobe Audition and the other Adobe media apps. That’s a good thing: while Apple has claimed that its pro apps work the same way, you’ll notice that Motion, Final Cut, Soundtrack, and Logic are all quite different. Adobe has nailed the consistency and, for me at least, the interface is very usable and attractive. Most importantly, the scroll wheel zooms — a long-time favorite feature from Cool Edit. The history palette, a la Photoshop and Apple Soundtrack, lets you easily step through different tasks. The history tab lets you step forwards and backwards through the edits you’ve made to an audio file, just as in Photoshop — a feature I expect we’ll see soon in Audition. Apple’s Soundtrack does this, and unlike Audition, it can also selectively enable and disable “action layers” for trying what-if scenarios with different combinations of effects. The simpler feature here, though, is very functional, and unlike Soundtrack, all your edits are immediate — no multiple rendering required, making Soundbooth far more usable in practice. Here’s what most average audio users need to do: open up a file, fix problems. If you can spend the extra on a more serious tool, it’ll be worth it, but these options could serve the casual user well. The noise reduction features are also very reminiscent of Soundtrack. Noise, clicks & pops, and rumble features already let you handle most restoration tasks, even in this early beta. Audition has more extensive options, but that’s the point: the controls are very simple and easy to follow, as opposed to the potentially overwhelming options in Audition. Some audio tools require you to open up a dialog box just to adjust a fade curve; Soundbooth lets you drag, which is a lot more logical. The best thing about Soundbooth currently is the smart editing features. 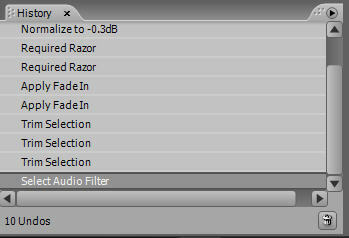 Normalization, fade in/out, and amplify settings are all right on the toolbar where they should be. The fade and amplify controls in editing are the real draw, though: drag on audio to amplify it, with a live preview of the waveform and numeric amplify readout. Drag a fade left and right to adjust its length, and up and down to adjust its curve. You’ll wonder why all audio editors (including Adobe Audition) don’t work this way. 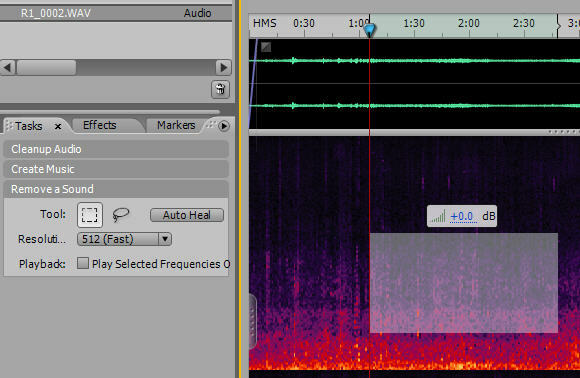 Looking at a sound file in terms of its spectrum makes it easier to isolate problems and make edits. 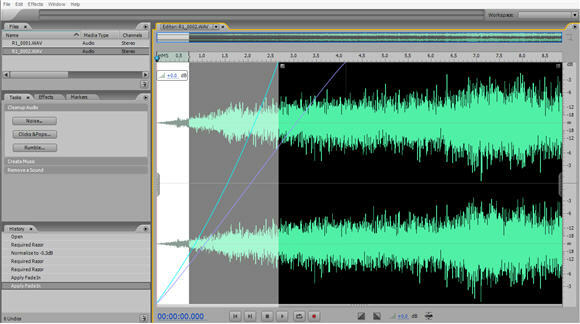 Some audio editors’ spectral views are read-only, without edit capability, but Soundbooth borrows the editing tools from Adobe’s Audition. Soundbooth also borrows the excellent spectral view from Audition. Other apps have had spectral views, but it’s the editing tools in this view that stand out. Click “Remove a Sound” from Tasks, and you can directly edit the sound in the spectral view. You can marquee or lasso frequencies as if working in a graphics tool, for fine-tuning removal of certain frequencies or certain sounds. 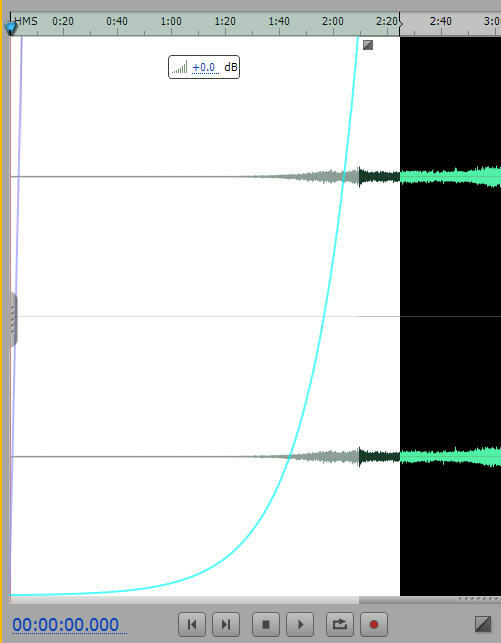 If you’ve ever struggled to remove a pop in the standard waveform view in most audio editors, you’ll be right at home. This feature alone should make Soundbooth a must-download if you don’t already have Audition. Soundbooth even has an auto-heal function in its sound removal settings. If Adobe would just add a paint on feature as in the graphical Mac-only sound app MetaSynth, I’d be in heaven. One curious feature is Soundbooth’s “automatic composition” settings, which seem to take a cue from the music-faking capabilities of rival A/V software giant Sony Cinescore. I was unable to test this feature because the sample files weren’t downloading correctly from Adobe Labs’ overtaxed server. The features look well-implemented; the more fundamental problems I have are that a) automatically-generated music never sounds like anything other than automatically-generated music, b) creatives are always trying to get out of hiring composers and musicians even when they have sizable budgets — darned cheapskates, and c) this is drawing attention from other features. With more interactive loop-based music creation in tools like Acid and GarageBand, and Sony’s own Cinescore, it seems like Adobe should concentrate on Soundbooth as an excellent starter-level audio editor — a niche that isn’t filled by other products and would fit a wider audience. I hope that in the coming months, Soundbooth gets more-robust editing tools. I don’t yet see tools for cross-fading when you make cuts, or other slicing and editing tools. Adobe could make these as intuitive as they made the fade in and fade out features, and this functionality would be useful to everyone, not just pros. More effects are clearer needed, as well — who needs a flanger, when more useful EQ settings would accomplish more? And Soundbooth would benefit from more presets, especially for features like the compressor, which regularly baffle the beginner Adobe is trying to court. But this is an early beta, so I don’t expect to see everything just yet. I just hope Adobe spends time on those features and not on dumping a lot of useless automatic music generation content into Soundbooth instead. Adobe also has an opportunity to focus on the way people actually use audio apps, including recording. You can already add markers while recording (huge timesaver). Now, for the beginner/consumer market, Adobe should add the ability to record audio from other Mac and Windows applications. Trust me, Adobe: the zillion users of Skype, people doing software training, and anyone who wants to capture app audio will thank you. I already think Soundbooth is a gorgeous app with a lot of potential. It’s easily worth downloading, because the nature of audio editors is that you don’t have to save project files when you’re done. In other words, you have a terrific free audio tool you can use until the beta expires early next year. At the very least, Soundbooth should fill a gap in the market for a basic, cross-platform audio editor, especially if Adobe prices it aggressively upon release. They have an opportunity to correct the mistakes Apple made with Soundtrack, namely, release a great audio tool, fail to evangelize it as such, then discontinue the standalone version in favor of a bundle with a video product. (CDM’s readers were extremely disappointed by those moves.) At best, Soundbooth could be a killer tool via integration with Flash and other features we haven’t seen yet. Soundbooth isn’t going to take much away from the far more powerful tools in Audition, which can do end-to-end production, integrate with Premiere, and produce CDs and multitrack and surround work. But if these features are a glimpse of the next upgrade of Audition, both apps are headed in a good direction. And it’s very nice to see Adobe going cross-platform again. I look forward to watching Soundbooth’s progress over the coming months and seeing if it lives up to its potential. Stay tuned.